So a few years ago when I read Dale Cramer's Levi's Will, there was this little section in it about how Will's father's family had attempted to make a settlement in Mexico work but due to their strong convictions of pacifism, they couldn't. 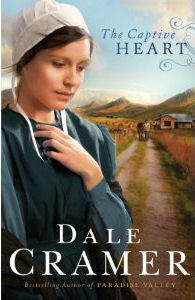 It was really thought provoking and intriguing to me so when this current series, The Daughters of Caleb Bender was announced, I was really excited because it's a historical fiction series based on these real events of an Amish community that attempted to settle in Paradise Valley. Last year when the first book came out, I absolutely loved it and couldn't wait for the next in the series. And it didn't disappoint! Miriam is in a difficult situation when the book opens because she is in love with Domingo, a local Mexican who works for her father. Miriam is already baptized into the church and so this presents a huge problem for her...to act on any feelings for Domingo essentially means to cut off her family forever. But she does have strong feelings for him and she suspects he feels the same way and so she tries to bring it up with him. He tells her their are too many obstacles between them, not least of which is the very different ways they see God. Miriam is crushed but tries to move on. Meanwhile, the situation with the bandits hasn't really gotten better and as a reader, every time they planned to go somewhere I felt so much dread! And with good reason, because there were several incidents with El Pantera in the book, many times that really terrible things happened and there was a lot of threat. In the beginning, Miriam explains to Domingo why they are pacifists, that violence is always wrong, that everyone is created by God. But as the book progresses it becomes clear the biggest threat is Hell...they believe they will go to Hell if they fight, even in self-defense. I feel like this is the central tension of these books--how can they believe so much in Pacifism when there are constant threats to them--their lives and their belongings. How can they sustain that belief? Can they make it in a world where the cost of really and truly believing that is steep? They settled in Mexico to flee religious persecution in the States, but the cost of actually living their beliefs out in freedom might be more than they can bear. To be honest, I love love love Miriam as a heroine much more than Rachel, for probably pretty expected reasons, she's independent, compassionate, and open minded. She's smart and brave. So I enjoyed every scene with her, her struggle to move on from Domingo and while I don't think trying to move on with Micah when she really doesn't love him is necessarily the most fair thing, in her world I can completely see why she tries. But the book takes an extended break from her POV in the middle to set up the major crisis that will change all their lives forever! Regarding the question of violence, I rather love the way it's approached. It might be easy to side with Domingo while reading and think the Amish ought to take care of themselves, but violence is not treated as something light at all by the narrative, and the costs of engaging in it, even in self defense, are clearly illustrated. It's such a fair handling of the topic, in my opinion. I don't think this is the last book in the series, but I'm curious as to what the next one is about. Two major threads were set up, I think, but I don't know if a third sister's point of view will be introduced or not. I feel like this review is a little bit all over the place, but in short, I really love these books, they engage interesting ideas of the practicality of living out your beliefs and are just interesting historical fiction as well!